Kavo Parts "More than just parts"
Xtra-Clean Filters are the most healthy solution for your customer, especially those who are sensitive for allergies. Learn more about Xtra Clean Filters and how they work by clicking here. Kavo Parts expands its range with shock absorbers! https://www.kavoparts.com/wp-content/uploads/2017/08/oie_MFT6ezdmsl3F.png 0 0 Darja Bronsvoort https://www.kavoparts.com/wp-content/uploads/2017/08/oie_MFT6ezdmsl3F.png Darja Bronsvoort2019-01-21 14:48:262019-02-18 11:21:52Kavo Parts expands its range with shock absorbers! East fits west! Over 1,900 Kavo Parts references are now connected to 14,100 European and American cars! https://www.kavoparts.com/wp-content/uploads/2017/08/oie_MFT6ezdmsl3F.png 0 0 Darja Bronsvoort https://www.kavoparts.com/wp-content/uploads/2017/08/oie_MFT6ezdmsl3F.png Darja Bronsvoort2018-08-20 11:15:352018-08-20 11:16:38East fits west! 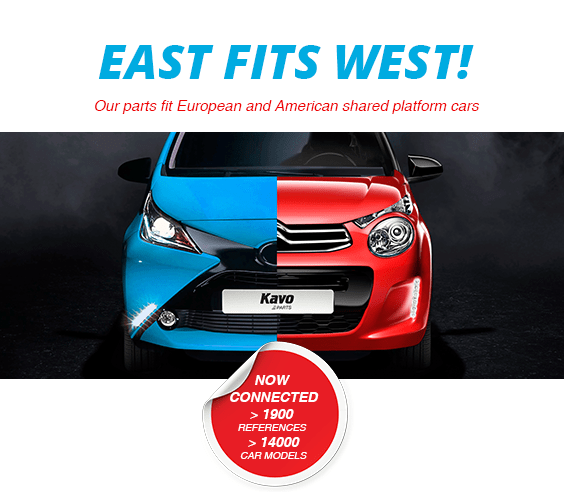 Over 1,900 Kavo Parts references are now connected to 14,100 European and American cars! We have been working with KAVO for many years now and I am really happy that we have reached this win-win relationship. I am proud to say that KAVO is one of my best suppliers and that, even though we are one of their farthest customers, they have always treated us as part of the KAVO family. Good products, friendly staffs and quick service… What more can you ask for ? Thumbs up for KAVO! Kavo has been to us a loyal strategic partner for almost twenty years. It is rear and valuable to have the feeling of support when attempting to really develop a country’s network. With Kavo we are looking forward to design and implement a viable plan for growing our mutual business. We are more than satisfied with Kavo as supplier of Automotive parts. Kavo exceeds their competition by delivering a wide range of high quality parts for a very competitive price.